You are here: Home > New physics comes from what is wrong with old physics. Here’s a famous physicist who is coming up with big (very small) ideas. These days the halls of physics are so vast the first problem for those who seek new physics is: Where is one to begin? History shows physics offers signposts of a sort: The path to new physics starts with what is wrong with old physics. At the beginning of the twentieth century only a few details were seen as wrong so they gave the search for new physics a tight focus. By contrast, what’s wrong with physics today seems to be everything. It’s not that today’s physics isn’t useful. It’s that in fundamental terms it is just a collection of fairytales—modern myths. Serious physicists are still searching for the real story. Lee Smolin is another physicist who ponders What is wrong? and Where is one to start? His work in quantum gravity and string theory takes him into the Planck-scale realm where we would—if we could—see space is actually made of tiny quantum pieces. Back in 2001 he wrote about a consequent problem: How do the pieces of space fit together. In a sense what he was seeking (though he didn’t say this) was a 3D Penrose tiling. His conclusion was that space could not be tiled, at least not smoothly. It’s like, he said, the structure of a crystal. He said, ‘If space really has a discrete atomic structure, then it is extraordinarily improbable that it would have the completely smooth and regular arrangement we observe.’ Here he’s bumping up against an edge of what is wrong with physics. 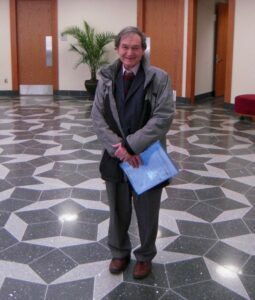 Penrose made a huge contribution to the mysterious new shape known as the amplituhedron, which is turning particle physics upside down. He invented twistors and twistor space (where, as explained last week, that new shape exists). Too bad he seems unable to go the final mile and think in terms of matter being made of particular space relations, as Smolin sometimes urges. It’s more than just needing physicists to think in terms that are purely relational. It’s also needing physicists to think in new ways about how things work at Planck scale. Like this: Those Planck-size pieces are not in space; they are space. Unlike Penrose’s tiles they don’t have a shape that needs to fit the next. Shape and size are properties that they don’t have so we are on the wrong road when we imagine them. They do have the property of volume. They are not news to Penrose; they too are in his book—that’s the New Physics of his title. So we see how Smolin’s problem is entirely self-inflicted. Though he no doubt knows better, he (like Georges Lemaître before him) thinks in terms of things like atoms. Which leads him to worry (like the narrator of my last book) about regular arrangement. If my beach bum can work this out surely Smolin can do better. The answer is the ideas he was still trying to think with, like continuous space, are meaningless at Planck scale. As the beach bum is a hacker he would call this GIGO—garbage in, garbage out. A mysterious new shape seems to say something fundamental about the nature of the universe. Can we understand its message? This universal principle created all space and matter from the beginning of time. Today, it’s still creating strange phenomena around the world.